A teenage Schoolie spent the night in hospital in an induced coma and another has been charged with grievous bodily harm after a night the police are calling "one of the busiest in the Schoolies Hub". A Queensland Ambulance Service spokesman told The Huffington Post Australia the 17-year-old boy sustained serious head injuries after an alleged assault about 12.15am Friday morning. "Paramedics worked on the patient at the Schoolies treatment centre, then he was transported to the Gold Coast University Hospital in a serious condition," the spokesman said. The teenager spent the night in an induced coma however a Gold Coast University Hospital spokesman said he was awake and in a stable condition by late Friday morning. Queensland Police Service Police charged a 17-year-old with grievous bodily harm and an 18-year-old with two counts of common assault. Both teenagers from New South Wales will appear in the Southport Magistrates Court today. 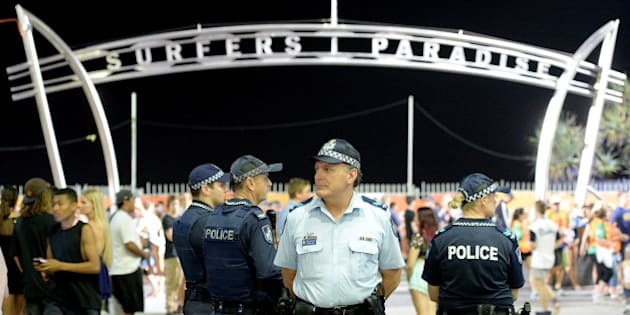 The two arrests were among 11 male schoolies arrested on 13 charges overnight and a further 36 schoolies issued with liquor infringement notices for drinking in a public place.